...As I Remember It...: Oprah meets the Kardashians? Oprah is catching a lot of flack for her feature of the Kardashian family. I have no idea who they are except that Kim Kardashian is now a part of the cast of one of my favorite TV shows, Drop Dead Diva. I have never watched the show, Keeping up with the Kardashians because they all seem wildly dysfunctional. For me, there is no entertainment value in watching that type of show. I don't get why people enjoy their show. 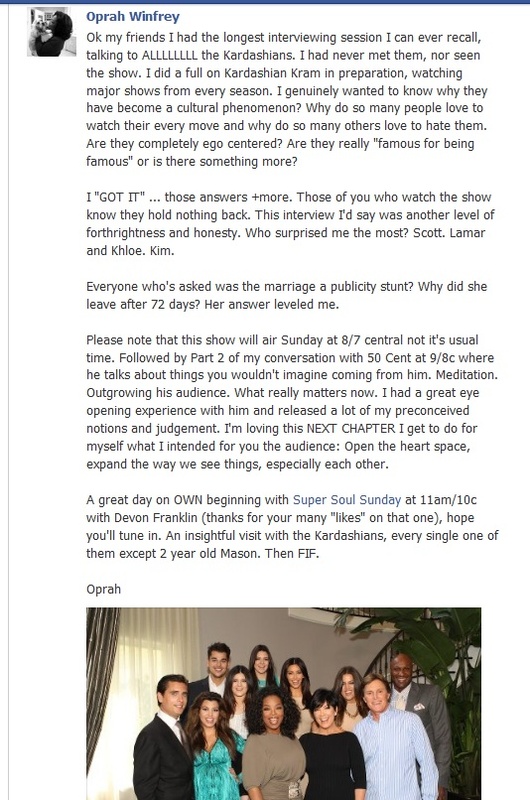 I follow Oprah and OWNTV on Twitter as well as on Facebook and I was surprised when Oprah posted why she interviewed the Kardashian family. Anyway, back to the Kardashians. I find it funny that Oprah would want to interview them. Of course, they're just normal people that had a really good agent to promote their dysfunction (think The Osbournes on MTV) and acquire a TV deal for them, right? And if this is the case, isn't Oprah just helping to promote more of the same? I remember watching Oprah's Master Class, the one that features her. She explains how she made an abrupt change in the direction that she wanted to take her Television show. She remembers speaking to a skinhead and he called her a monkey because she was Black. In that moment she realized that she was promoting Neo-Nazi brand of hatred by providing a platform for them to spread their message. What, may I ask, is she spreading by featuring the Kardashians? I just don't get it but I'm curious as hell. Will you be tuning in to the Oprah meets Kardashians episode? I will be tuning in if I can catch it. I am on the side that actually enjoys watching all the Kardashian shows. Tyler Perry caught the same negativity from his audience when he casted her in one of his films. His bottom line on that - she is relevant and attracts more youth than people realize, so why not give her something positive to shine their way? I've always enjoyed the light-hearted Oprah, so this will be an episode I look forward to. If people don't like them..fine. But when they start casting hateful comments and spewing disgust, i mean really? It's not that serious. I don't get what it is about them that people hate so much. For me, they are light and easy going entertainment. They hold nothing back good or bad and recently..even ugly. There are elements of their show that I can relate to (family drama, marital issues) and things I can't ($$$). I know people feel they have no talent, but let's not deny one thing - on top of being business owners and millionaires.. they are GORGEOUS! At least I think so. And who doesn't like to watch a pretty face? They have also proven to be classy with their fans and the people they work with, charitable with their earnings and time (which pulls at my heart strings automatically with anyone), and hard working. At any given time they are funny, annoying, sensitive, loving and bitchy with themselves and with each other. They fight, they make up, they call each other out on their ways and accept it or don't. All things a family like mine has to deal with, which for me, makes them relatable and fun to watch. I'm sure this is why millions of others watch them as well.